Furniture, textiles, lighting and vegetation. Ideal symbiosis for home decoration. But terraces and gardens often escape this set. Complexity? Maintenance? Today we find many answers. Who does not like to enjoy the outer space? The prestigious brand Manutti offers a wide range of products for our outdoor enjoyment. This year surprised us with the Echo model; the new chair with armrest is a contemporary and vintage combination. In addition to an elegant design, Manutti offers unparalleled seating comfort with components such as the high, curved, rectangular backrest and the new firm, but supple seat in a woven rope finish. To complete the dining area, Manutti’s Air table has a sleek and clean-cut design, full of character. This dining table comes in two sizes and can be equipped with two table tops: iroko hardwood or ceramic. This sofa playful and airy concept comes with two modules that can be used in different indoor and outdoor environments, both in private and in public, large or small: intimately, on a terrace or in the pool, but also in the reception area hotels or public buildings. In the relaxation area, the new Kumo collection. 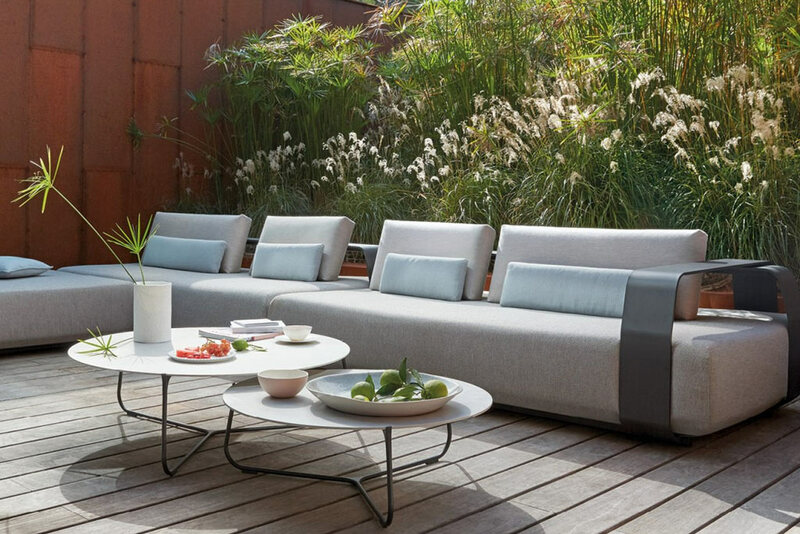 Kumo, the Japanese word for cloud, is a light, tautly designed and contemporary seating island that will be previewed at Maison&Objet, introducing the new season’s outdoor trends. This playful and airy sofa concept comes with two modules that can be used in different outdoor and indoor settings, both privately and publicly, large or small: intimately, on a terrace or by the pool, but also in the reception area of hotels or in public buildings. Kumo invites you to create a personalised outdoor cocoon: its concept with inter-changeable covers comes in different shapes and sizes, decorative pillows, seat and back cushions which you can choose from the extensive Manutti fabrics range. The armrests and back supports are easily adjustable and can be moved around, transforming the Kumo cloud into a plush sofa or stylish lounger, a lounge chair or cool footrest. Mixing and matching was never this easy! Woven vinyl mats and carpets Keplan, born as a result of a search process and research of new materials whose result has been arevolution in the sector. Its technical characteristics give these carpets advantages of an unpublished until now. His resistance to the passage of time, wear and water, the possibility of washing even with bleach, high fire resistance and acoustic insulation being, make keplan ideal for use in public spaces such as offices and shops, but also not only are washable rugs that could be used as kitchen rugs, also repel dust and animal hair, which makes them ideal as carpets Available. Vinyl Keplan carpets allow innovative designs and customized to suit the client, so currently, its use in homes becomes more important every day. Lamps filled with glamorous crystals that reflect light! Stunning fully prepared for outdoor lamps. This year Massiero has created also a mobile application to change the color and intensity of illumination. The new trend of vertical garden! With these special plants for outside, anyone can enjoy this evergreen garden in a minimum space! What do you think? You can find this and much more at Mobile Diseño Marbella.